Three faced Rudraksha or Teen Mukhi Rudraksha has three natural lining on its face. This bead is generally found in oval or round shape. Mars, in Astrology, denotes the confidence, force, action and blood in the chart of a person. Benefic Mars gives immense energy and confidence and negative Mars deprives a person from these qualities. The ruling planet of Teen Mukhi Rudraksha or Three Faced Rudraksha is Mars. If Mars is weak by virtue of placement in the horoscope, this bead helps in removing all the negative effects of the same. 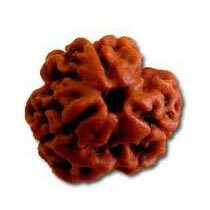 The deity of this Rudraksha is Agni. This bead also symbolizes Trinity in the form Brahma, Vishnu and Mahesh. Three faced Rudraksha improves lack of confidence and makes a person fearless. The past sins are also washed away and soul is purified by wearing this bead just as the fire purifies everything. Inferiority complex is removed and the wearer becomes independent, active and prosperous. Thus, mental strain is also cured which is generally caused by the malefic effect of Mars. This bead is also believed to remove the Manglik dosha in the horoscope of an individual. This bead protects a person against various diseases including fever, blood pressure, inferiority complex, lack of confidence, digestive problems and weakness. To get the maximum benefits from this bead, the above mantra should be chanted 108 times (One rosary) daily. The auspicious day for wearing this Rudraksha is Tuesday.